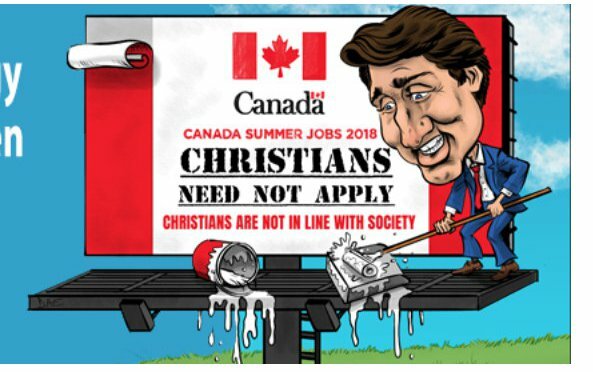 Between its progressive history, Canada’s Supreme Court, and far left leader, Prime Minister Justin Trudeau, our northern neighbors are gradually forcing Christians into the closet. But before you say ‘that could never happen in America’ or, ‘as long as it doesn’t affect me,’ let’s look at three disturbing news stories. Just across the U.S./Canadian border, a Christian bus driver was arrested and charged with a hate crime for evangelizing. Bill Whatcott gave out gospel pamphlets at a Pride parade saying homosexuality can lead to diseases, (which it can) and Jesus can save gay people if they repent of their sins (which He can). Apparently, they’ve reinterpreted John 3:16 to suggest God so loved the world – except for the LGBTQ – that He sent His Son, Jesus Christ to give His life as a ransom for the sins of whoever believes – unless you’re LGBTQ. This must be the New Liberal Translation. But the Bible is true and every word can be trusted. So if you and I love our neighbors, whether they live down the street or across the Canadian border, the love of Christ compels us to tell them the good news that they can be forgiven and saved. It’s not up to us to convict or force them to receive the truth. We’re the messengers. Bill Whatcott was not only fired from his job, but faces two years in prison as well. And Justin Trudeau became the world’s first national leader to march in a gay pride parade two years ago in Toronto. It was a proud first for his Liberal Party – a Party that also introduced a bill that would punish perceived “discrimination” of transgender individuals – with up to two years in prison. And if you missed it earlier this year, Ontario Province now allows people born there to remove “male” or “female” from their birth certificates and opt for a “nonbinary” or unknown gender designation. Next, according to Canadian elites and the LGBTQ mob, “diversity” now means all views and beliefs are welcome – except the Christian worldview. Canada’s Supreme Court recently ruled 7-2 against a Christian college, Trinity Western University’s (TWU) Law School, essentially forcing them to choose between biblical standards or accreditation, basically suggesting Christianity and academia are incompatible. Some liberals in North America now think these Christian values are harmful to society. Remember: Truth is hate to those who hate the truth. But don’t be too quick to bash Canadians. Americans have gradually allowed discrimination against Christians in our own education system. So it would be foolish and naive to think religious intolerance won’t increase in the U.S.
God doesn’t change, and fixed moral absolutes exist by which we govern ourselves and our culture. But to those wanting no accountability, relativism rules, man is god, and anything goes. You see, if naturalistic evolution is your starting point, there is no ultimate authority; The result is …a society clearly in rebellion against God. God created the institutions of marriage and family with one man and one woman (Genesis 1:27), so he gets to define them. Truth is eternal (PS. 117:2), and free speech should be protected, but this debate over what is in the best interest of children will continue; a debate that will soon find itself in the courts of America. This entry was posted in LGBT and tagged free-speech, https://godnotspokenhere.wordpress.com/, kicking-God-out, LGBT by pmaillet. Bookmark the permalink.